Some of our fountains are as low as $20, and are just as beautiful as the rest! The short triangle bubbling fountain (left) is a simple, yet exquisite, addition to any home or garden. Sometimes, less is more! 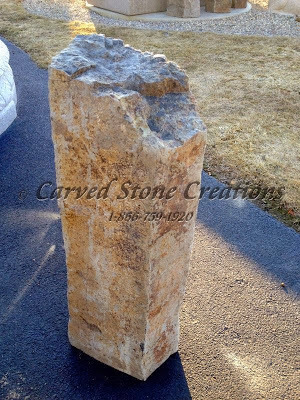 The large bubbling basalt column fountain is $500 and serves as a unique addition to your garden! 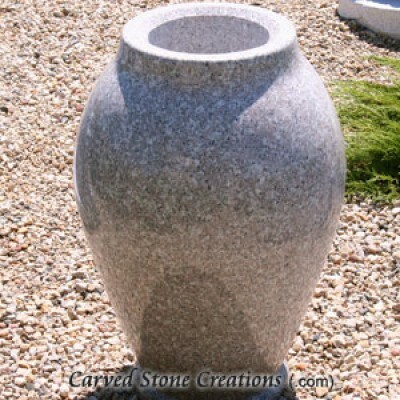 It provides a soothing water sound while accenting your landscaping with its rustic design. The $544 single koi spitting boulder fountain (left) is truly a work of art. 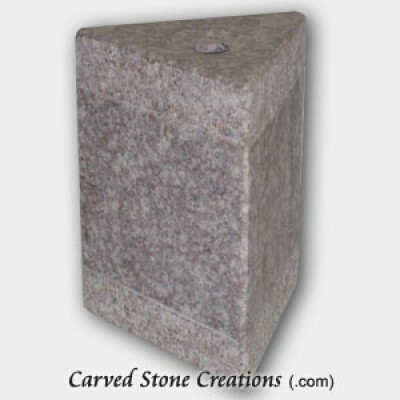 What better way to accent your garden than with a granite fountain inspired by nature? Our polished bubbling urn fountain is $875. 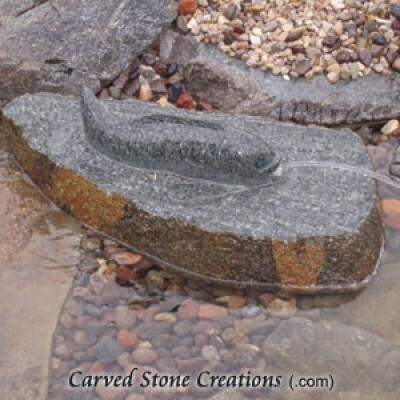 Its beautiful design is handcarved from wild rose granite with a polished finish. Both of these are one of a kind items you can use to accent your landscaping. There are endless design opportunities with every budget! As seen on the left, the $1,500 spitting koi fish fountain is a peaceful and unique addition to your home. 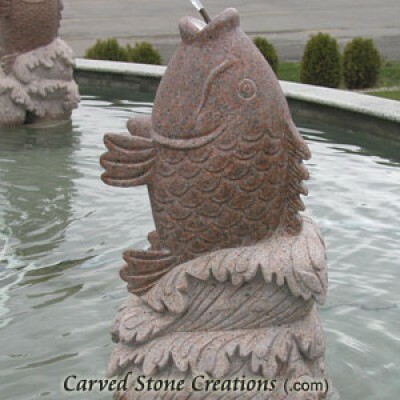 If you come from a background of fishing or simply enjoy the design, this piece is perfect for your pond. Next, the 4-tier acanthus self contained fountain for $5,000 is truly a classic. 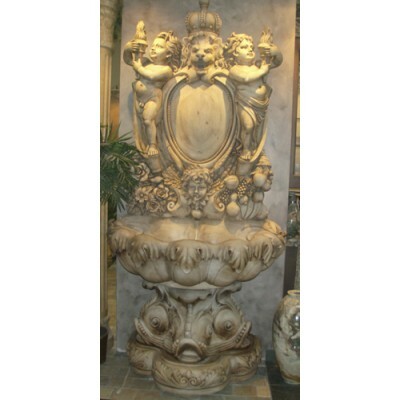 It is handcarved from natural stone and has detailed designs from base to spout! The sky’s the limit with our stone fountains. The classic marble wall fountain (left) is $7,450 and features a beautiful sculpture with antique white marble. It also has detailed carvings of fish on the base. 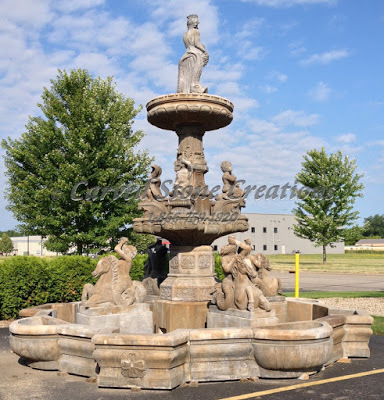 The large classical tiered pedestal statue fountain is $36,500 and looks like a dream. It features Neptune, horses and four surrounding statutes at the bottom. The possibilities are endless, especially with our vast variety of prices! If one of these designs caught your eye or you have ideas of your own, contact us today!